If you have installed a fireplace in your home or you have fallen trees from your garden or backyard, you have without a doubt spent a good number of hours splitting the logs with an ax. In case you’ve got a steady supply of logs that needs to be cut, you should consider investing in an electric log splitter to lessen the time and energy required to split your wood logs. 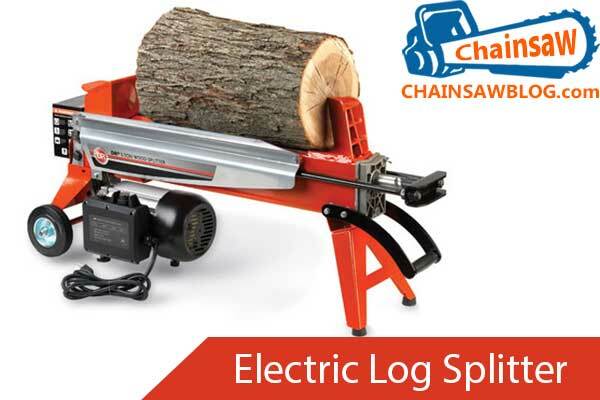 So, how does an electric log splitter work? An electric log splitter (or a general wood splitter) works the same way a person would with an ax. A hydraulic pumping system is used to push the log into the blade, or it swings the blade at your log to split it- this depends on the design of your splitter. In simpler words, all that you need to do to run your wood splitter is to place the log on the machine, and it does the rest. A 5 horsepower electric-powered engine. A 2-stage hydraulic oil pump (rated at a max. of 11 gallons/min). 3.5-gallon hydraulic oil tank, and. 4” diameter, 24” long hydraulic cylinder. The two-stage hydraulic pump is an excellent time saver. It comprises two pumping sections as well as an internal pressure-sensing valve that passes between them. One section of this pump produces the max. GPM flow rate at low pressure. It is used, for instance, to pull the piston back (out of the log after a successful split process). Pulling the piston back to the hydraulic cylinder does not require a lot of force. And because yon at this to happen quickly, you’d want to ensure the highest flow rate of pressure at the low pressure. However, when you push the piston into the log, you will need the highest pressure possible to so that you generate a maximum splitting force. Flow rate won’t be a big concern here, so the pump will switch to the high pressure, low volume state to split the current wood log. Numerous homeowners prefer the horizontal wood splitters. These machines are usually less expensive, just because they can process smaller sizes of logs. Unless you have logs of a noteworthy size that needs splitting, the horizontal splitter ought to be sufficient to meet your wood needs. On the other hand, vertical splitters are typically equipped for dealing with wood logs of different sizes- including the long and the wide segments of tree trunks. These splitters are generally more costly and are mainly employed by the professional tree removal and debris clearing services. Electric wood splitters might be a valuable investment for those who suffer from shoulder and back pains when they use their hands to split logs. Similar to any other heavy machinery, an electric log splitter can turn out to be dangerous and even cause serious injuries to the user when running erroneously. So, any time you buy a new electric wood splitter, set aside enough time to carefully read and understand the user directions before turning on the machine. Always ensure you wear suitable safety gear while working with your splitter. Splitters have a tendency to be somewhat costly. If you just have a few logs to split, or if you don't require wood on a regular basis, buying a splitter might not be a wise investment for you. But for individuals who split wood yearly or those who have trees removed from their gardens and backyards on a regular basis, may find that wood splitter a significant investment. To keep your wood splitter at perfect working conditions at all times, ensure that you clean it thoroughly and correctly. Additionally, keep it oiled and free of any debris in between the uses. Be sure to read all the cleaning instruction laid out by the manufacturer and follow them to the letter. With this simple but careful cleaning and maintenance, you’ll be surprised by the many years your splitter will serve you. It’s also good to note that most wood splitters come with some extra features- such as excess wood debris traps and self-cleaning mechanisms. Such impressive features might increase the cost of the machine, but you’ll be pleased to note that they make cleaning and preparation of the machine easier when splitting logs. That’s it about the electric wood splitter- how it works as well as some additional information on how to keep it in excellent working conditions. If you are searching for the best wood splitting alternative, or if you’ve got a big pile of wood to split, you should consider investing in this wood cutting machine to handle the project for you efficiently. Electric wood splitters are highly affordable, portable, and convenient.